If it gets hotter like they say, it'll revert to the 'sleeping outside until it rains / dew falls' routine. I'm not fond of the Summer myself. I prefer the Autumn. You can always warm yourself up but you can't always cool yourself down. You can always warm yourself up but you can't always cool yourself down. Eaxctly. Listen to the man. We're not descended from Vikings and Saxons for nothing ! I get pretty fed up with being exhausted during the day. I've got myself a blindfold for sleeping, which helps in summer when the sun comes up well before the alarm does. My friend has bought "blackout blinds" because she works shifts. It's excellent for keeping the bedroom bathed in darkness - keeps it cool during the day too! We are struggling at the moment as we had cavity wall filling installed last winter which is designed to hold in the heat. So we have to have a large fan blowing over us at night as it's unbearably hot in the bedrooms at the moment. Having said that, once asleep, I do sleep soundly. I got 10 hours of sleep last night. 7 hours and including the anti-psychotic mirtazapine nightly dose as well! 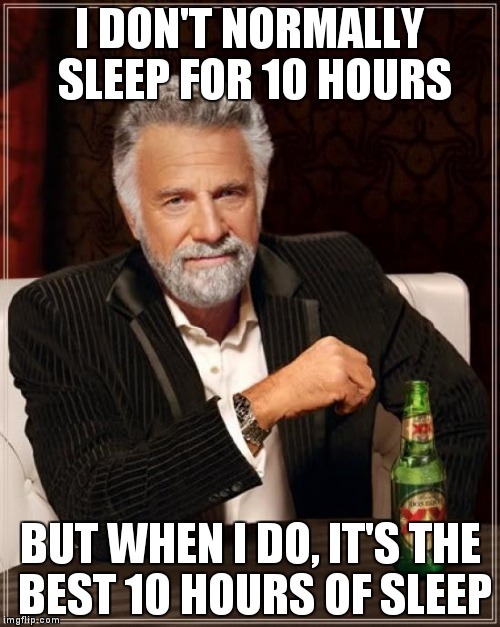 I usually fall asleep in the afternoon some times. If not then I get 9 hours.